« How do I read the Modbus fault code in my Honeywell RM7800 flame safety controller? The LIST button in the status bar (left of Screen) brings up a sub-menu with the Mark button. The mark chart button brings up a list of up to 20 preconfigured messages you can use. If none of the preconfigured messages is adequate for your use, choose Blank, and the touchscreen keypad will appear. Enter your text and click the green checkmark button. Select the next available marker number, and enter your text. The message can be entered or edited from the touchscreen keyboard, an external USB keyboard, an external USB barcode reader. If you’re browsing the recorder from a PC over a network connection, and Remote Control is enabled, you can add preset markers to the recorder through your web browser interface. Any of the preconfigured messages can be printed on demand either by the signal from a remote digital input or by a local alarm using the Event option. If you use a Modbus master to compose and transmit messages to a recorder, ASCII-character messages can be marked on the chart. This Modbus option is used with PLCs and SCADA masters that have the power to analyzer and compose messages. Here’s a presentation showing how ModScan32, a generic Modbus Master program can be set up to transmit a text message to the recorder. In this case, the word Cleared to mark the chart. Process values with their associate tags (and units) can be printed out at periodic intervals, using so-called embedded variables. The screen shot below shows tags and values, but the user elected not to show the °C units. So, there’s lots of ways to mark a paperless chart, it’s just a matter of picking the most convenient and appropriate means for your application. 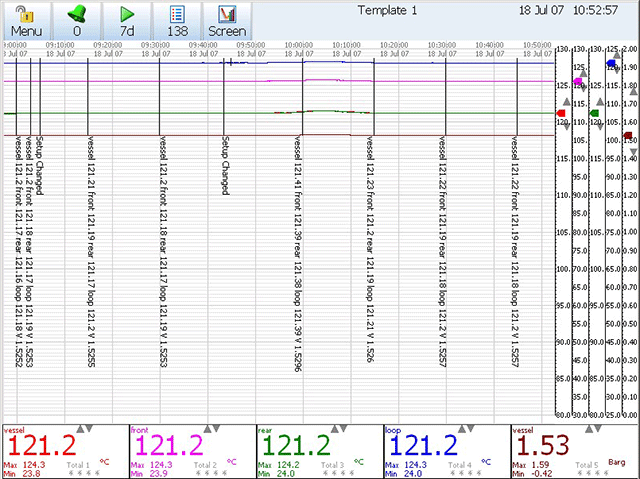 This entry was posted on July 21, 2014, 11:19 am and is filed under Configuration, Honeywell, Modbus, Paperless Recorders, Recorders, Trendview X-Series Paperless Recorders. You can follow any responses to this entry through RSS 2.0. You can leave a response, or trackback from your own site.